This exhibition of more than 30 years' work revealed Stephen Antonakos as an artist willing to skirt the very edge of nothingness and—as seen in some of the pieces here—go to elaborate lengths to do so. 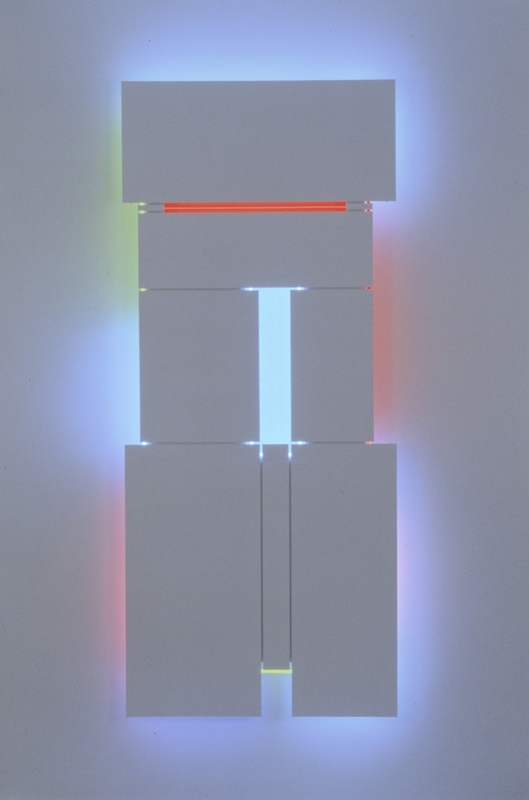 The best works in this show, titled simply "Antonakos: Whites," were the large-scale wall reliefs in foam board and neon tubing, bearing such titles as Depar­ture (2007), Arrival (2008), and Voyage (1999). The last is the earliest and best resolved of the pieces. This not-quite-symmetrical stack of rectangles achieves the most enigmatic of color sensations. The sequence of fluorescent colors—blue, pink, blue again, deeper pink, brighter blue, and apple green—that illuminates the perimeters of the shapes transmutes their white surfaces into a kind of dark­ness. The effect is quite striking. The other pieces here were much smaller in size and, unfortunately, in im­pact as well. A num­ber of the "Unfilled Wood Reliefs" from the '80s were, at their best, suggestive of a particularly buoyant sort of construc­tivism, although they often looked like overly elaborate book covers. Also included here were a couple of attractive cut-paper pieces, and seven examples from the artist's "Winter Se­ries" (2008-9). Antonakos calls these "crumples." They consist of single sheets of paper or polyethylene film scrunched up and then imperfectly flattened out again for framing. It was difficult to grasp the significance of these pieces beyond noting the irregu­larity of their appearance and the chance method of their produc­tion. Their inclusion almost under­mined our appreciation of his better work here, which is indeed strangely compelling.